SCVHistory.com LW3451 | Beale's U.S. Camel Corps: Hi Jolly's Tomb & Cemetery, Quartzsite, Arizona. October 30, 2018 — Hi Jolly's Tomb and Cemetery, Quartzsite, Arizona. The last camp of Hi Jolly, born somewhere in Syria about 1828 / Died at Quartzsite December 16, 1902 / Came to this country February 10, 1856 / Cameldriver - packer - scout - over thirty years a faithful aid to the U.S. government. Arizona Highway Department, 1935. The famous camel herd with which the name of Hi Jolly is linked constitutes an interesting sidelight of Arizona history .... Jefferson Davis (afterward president of the Southern Confederacy), as Secretary of War, approved a plan to experiment with camels for freighting and communication in the arid Southwest .... Major Henry C. Wayne of the U.S. Army and Lt. D.D. Porter (later a distinguished admiral in the Civil War) visited the Levant with the storeship Supply and procured 33 camels which were landed at Indianola, Texas, February 10, 1856. 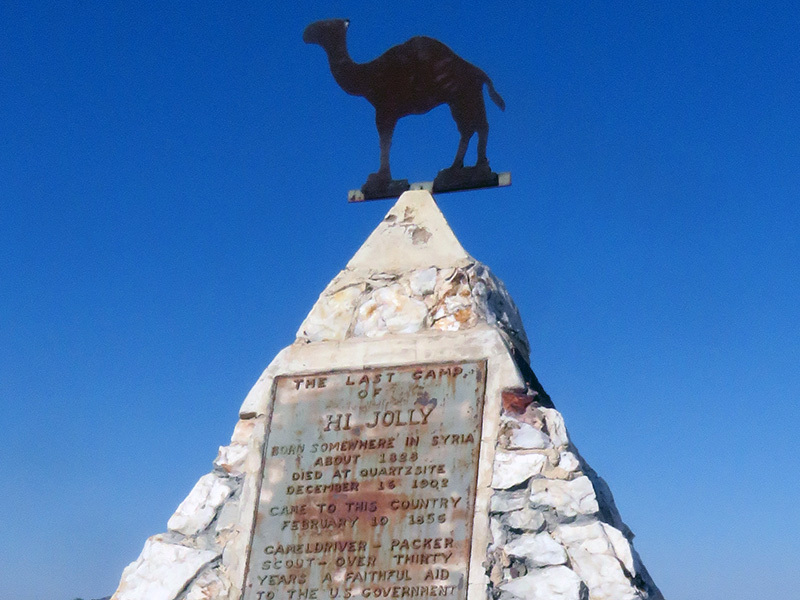 41 were added on a second voyage .... With the first camels came, as caretaker, Haiji Ali whose Arabic name was promptly changed to "Hi Jolly" by the soldiers, and by this name he became universally known. His Greek (?) name was Philip Tedro ... On the Beale expedition in 1857 to open a wagon road across Arizona from Fort Defiance to California, the cames under Hi Jolly's charge, proved their worth. Nevertheless, the War Department abandoned the experiment and the camels were left on the Arizona desert to shift for themselves, chiefly roaming this particular section. They survived for many years creating interest and excitement .... Officially the camel experiment was a failure, but both Lt. Beale and Major Wayne were enthusiastic in praise of the animals. A fair trial might have resulted in complete success. LW3451: Download higher resolution images here.